Today many home musicians and guitarist take guitar effects for granted. Compared to the old days, effects are now so easily available – in the form of digital processors and software plugins. While music is art and there is no single rule to using effects, it’s beneficial to understand how effects are altering your sound. With a better knowledge of guitar effects & pedals, you’ll be able to make better music. Or at least, you know how to get that sound you’ve been hearing in your head out. As a guitarist, you probably get excited whenever you come across a new effect pedal. And as a beginner, you need to know how to choose a guitar pedal to start out with. In fact, the music industry has seen creative ways guitar effect pedals has been used by not only guitarists but even violinists, vocalists, and keyboardists. To stress again, there are no rules to using effects, but before we go into some complexity, first you need to understand the few guitar effects that you’ll usually come across. When you play the guitar, an audio signal gets passed from your guitar to an amplifier. And within that straight path, you can put in effects between the guitar and amplifier. This also means the order of your effects will modulate and give you a different sound. For example, placing a compressor before a reverb effect would give you a very different sound if you were to put that in reverse. 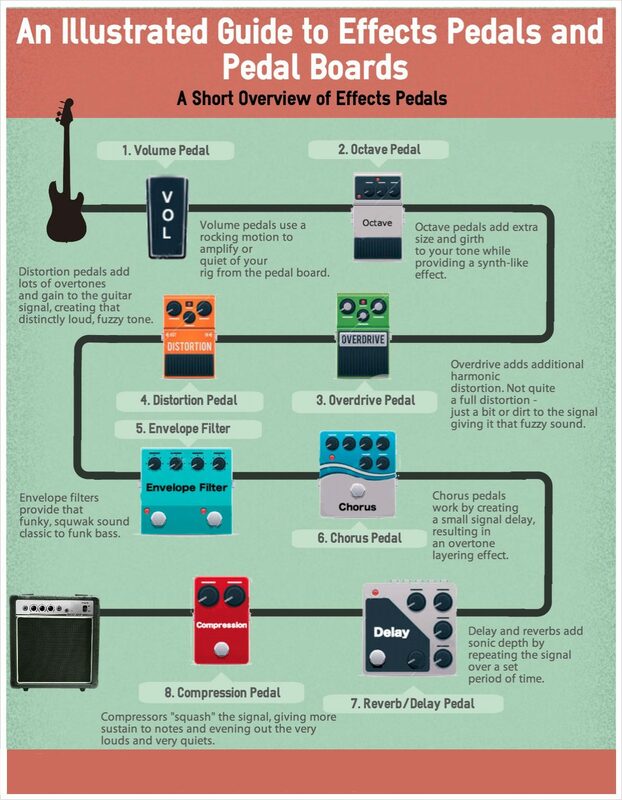 Here is an infographic to show you a common arrangement & flow of a set of guitar pedal effects. Starting with the first usual components in an effect signal flow, gain staging, sometimes known as gain structuring is basically setting enough gain in the amplification stage within sound systems, amps, and mixers – all to achieve a pleasant audible sound without too much noise and distortion. There are many types of gain staging effects from clean boosting to hot fuzzy effects, so let’s get started. Gain boost pedals are basically pre-amps for guitars, accepting high-impedance audio signals. So what are the difference between them all? Some gain pedals offer tonality tweak options, but most feature only a single volume knob and a footswitch. A gain boost pedal serves two purposes. You could use it to push more gain than you would need, causing overdrives effects. Some refer this process as pushing hot signals. The other use for gain boost pedals is to bring the volume up again, compensating for signal lost with the many effect pedals you have in your guitar board chain. Of course, in that case, you’ll have to put the gain boost effect at the end of a pedalboard. The most common form of distortion is known as overdrive. You often see them on guitar amps and even software plugins. Moving beyond the boost pedal, the job of an overdrive effect pedal is to simulate that clipping point you get when the gain boost is pushed too far where it starts distorting. The more volume you drive, the more intense the distortion becomes, thus ‘overdriving’ it. There are no best overdrive pedals to choose out there, as many of them typically do the same thing – while some overdrive pedals add color to your sound. It boils down to whether you want a transparent sounding overdrive effect or you’d like something with an added color for a change. TC Electronic MojoMojo – Great sounding OD pedal for various types of music genres. Ibanez TS9 Tube Screamer – Warm sounding overdrive that will sound good even on higher note ranges. You get for what you pay for! Most distortion pedals like those used for metal and grunge are pretty bold about their fluctuation. An overdrive processor while still distorting your instrument’s sound has a fairly mild effect. Most pedals don’t rely on gain fluctuations. Instead, they just change the wave shape. It should be noted that overdrive’s warmer tones disappear alongside much of the original timbre of your instrument. A distortion pedal is fairly straight forwards as it sounds. It distorts the tone of your instrument. Not only that, but it can also provide a certain tone that you may or may not like to your guitar. Do you know that a distortion pedal can also be somewhat of a compressor? The reason is that the more distortion that is added, the more the signal becomes crushed. This results in loss of dynamics. Do you know that a distortion pedal can also be somewhat of a compressor? The reason is that the more distortion that is added, the more the signal becomes crushed. This results in loss of dynamics, creating sort of the compressed sound. Another really popular and specific type of effect is fuzz, common in the metal and industrial genre. Chances are you also see used for vocals as well as instruments – well the guitar. Fuzzboxes add a certain kind of distortion that sounds just like the name – fuzzy. The original signal is totally changed and morphed into a square waveform. It’s like the sound hits a wall and then reforms into a new entity before carrying on. Fuzzboxes add a certain kind of distortion that sounds just like the name – fuzzy. The original signal is totally changed and morphed into a square waveform. It’s like the sound hits a wall and then reforms into a new entity before carrying on. Fuzzboxes can also add a slight harmonic overtone to help give an artificially rounded and warmer sound. Using adjustable frequency multiplier the harsher sound is modified and can create harmonic overtones instead. A little bit of fuzz effect sometimes help to shape your tone whether on the guitar or even when you’re producing on your DAW. A little bit of fuzz effect sometimes help to shape your tone whether on the guitar or even when you’re producing on your DAW. The effects under time-based effects are exactly what the title say about them. They are designed to alter time, space and width to your sound. This can add lots of sound flavors that you hear in many music pieces. Reverbs are used in a lot of records & music. No matter the song you hear, there will be reverb in it. Reverb works by simulating a space – small or big. It creates an atmosphere for your sound and with different pedals, comes different options and tweak-ability. Think about how your guitar would sound in a cave versus in a car. Because of how sound bounces around within an environment, both the environments would give you totally different sounds. There are many types of reverbs ranging from emulated rooms, halls, studios to classic emulations of plates and springs. It’s hard to know which reverb pedal suites who because in the end, it’s all down to individual taste. Halls: There are many types of halls ranging from cathedral halls to large concerts. These type of reverbs will generally give you a very spaced out feeling as if you were playing in the middle of the hall itself. It will have a very slow bounce back time(the sound) as the walls are much further away but your results may vary depending on the preset you choose. Rooms: Like halls, rooms give you the same thing just without the large spaced out feeling because in a room the walls are nearer, therefore, making the sound bounce back faster. Typical room presets are small, medium, large studios, bathrooms or living rooms. Results will vary depending on the product you get. Plates: This kind of reverb was the very first artificial reverb ever created. It doesn’t sound realistic (compared to hall or room reverbs) but it has a very close sound compared to a hall simulation. A plate reverb is basically a steel plate. The plate gets vibrated with the signal coming from a transducer and therefore picked up by a contact microphone. You’ll find plate reverbs to sound metal-ish and sort of bright tinny sounding. A flanger pedal is quite a difficult one to explain. A flanger effect sound a little like a chorus effect or even a vibrato effect when tweaked.This is why chorus pedals are often confused with flanger pedals. To make it simple, try to imagine a sweeping sound that constantly goes up and down. This is what a flanger does. It produces a sweep along the frequency range. This is known as a filter. A flanger delays the sound very slightly and then alters the delay over time creating phase cancellation which happens with two waveforms collide and cancel the sound. 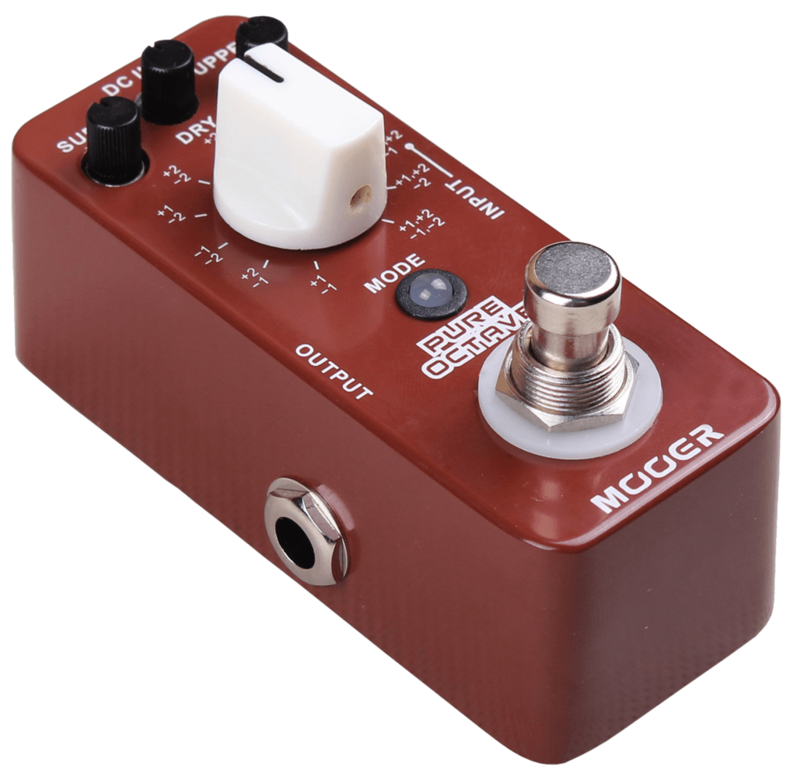 Most flanger pedals have controls that include the modulation depth which controls how much the sweeping sound is produced, the rate that controls how fast the sweeping sound is produced and so forth like the amount of resonance and the amount of feedback. The vibrato effect can be described as sound fluttering/shaking or a variation in pitch as the sound is produced. It is often a common term used in singing where as a singer sings, sometimes they add vibrato. You also see violinists or string players often doing the vibrato effect with their fingers, to get that pleasant sound. A vibrato pedal can be confused with a tremolo pedal which also flutters the sound, but the difference here is that a tremolo effect varies the volume of the tone whereas a vibrato pedal modulates pitch the sound in the way of a Leslie rotary speaker. It has fairly basic controls such as rate that controls how fast the vibrato is being produced and the depth which more definition to the vibrato. EQ stands for equalizer. What an equalizer does is fairly simple. It shapes the tone and sound that you want depending on what genre you play. An EQ effect has a frequency range, divided by Hz to kHz. For example, a 10-band EQ has 10 bands to adjust individual frequencies that are given. If you boost the frequency, for example, 500khz, you are boosting the mids. The same also goes when you are reducing the frequency; you are lowering the mids which gives you a scooped sound. Though equalizing is a must in any music production scenario, mixing & mastering, the EQ pedal is quite underrated in the guitar world. Rather than focusing on shaping tones with an EQ pedal, guitarists usually use other pedals to shape their sound, instead of focusing on the simplest thing. I’d advise going for an EQ effect pedal only if you really want good control on your sound tonality. Depending on how you want to shape your tone, there are many options now on the market. A delay pedal does what it name states. It takes the original sound or signal and repeats (feedback) it many more times depending your settings. There are many types of ways sound is usually delayed, such as the ping pong effect that basically bounces the signal left to right or the popular slap-back effect which is a short delay time giving you a “slapped” sound. Most delay pedals have basic knobs onboard. You have the time knob which is used to set how fast or slow you want the delay to occur, and the feedback knob which determines how long the delay will last. On certain pedals, you’ll find mix knobs or what I would like to call wet/dry knobs where you can use to combine the original sound with the effected sound – by having a dry-er signal or giving your tone a really long delayed sound. Some modern delay pedals nowadays even offer a tap option where you can set your desired delay tempo to your satisfaction. The phaser, also known as a phase shifter works near like a flanger but is not really like a flanger. Confused yet? It is based on an LFO (low-frequency oscillator) that works to modulate the frequencies, thus creating a sweeping effect that phase cancels the frequencies like a flanger. The difference is phasers is much more subtle and doesn’t cut off the frequencies as much. On most phaser pedals, controls are relatively the same towards a flanger. The rate knob controls how fast the sweeping happens, the depth knob gives you more or less of the effect. And of course, you’ll sometimes find more tweak-ability options depending on which phaser pedal you get. A compressor helps “compresses” the signal made by your guitar. It normalizes the dynamic range of the audio input signal based on a threshold value. Compressors are nearly a must when it comes to audio recording. In fact, everything you hear in music that is produced today is compressed in some way – and compressors can sound anything from a subtle & barely noticeable effect to a thick, dampened squish. Some people like to use high-levels of compression to get that certain ‘marshmallow-like’ tone. The tone sounds squashed and loses its dynamics, but in a way, can sound really strong and thick. Not everyone will like this heavily compressed tone, but preferences may vary. In conclusion, a compressor is essential to getting a more tamed sound or really, getting your sound controlled. Imagine a group of singers singing the same note. Everyone sings the same note, but they are slightly different from each other in terms of pitch & timing. You get the ‘chorus’ effect from that and chorus effect pedals, try simulating that effect. Generally, a chorus pedal works by creating slight variations in the pitch and also the timing of multiple performers. It’s one of the more commonly used effect pedals and helps give your sound a slightly “dreamy” quality. It’s a great choice to use with acoustic guitars, electric pianos or clavinets. Yet, people get confused with chorus and flanger pedals because they give a very similar tonality. Think of a wobbly sound or the sight of rippled water. That’s how a chorus effect would sound like. Yet, people get confused between the chorus and flanger pedals because they give a very similar tonality. Think of a wobbly sound or imagine the sight of rippled water. That’s how a chorus effect would sound like. Chorus pedals usually have controls for tone, used to control whether the chorus effects the low or high frequencies. You’ll also find a rate knob, that controls how fast the chorus moves – just like the sweeping effect of a flanger pedal, and the depth knob used to present how the heavy the chorus effect will be. Octave pedals, pitch shifters, harmonizers, you name it. These are really cool pedals that can give you unique sounds, but particularly for an octave pedal, it can do two things. It can give you a low octave in addition to your original sound, or it could be a high octave. Most octave pedals nowadays provide an extra option of a pitch shifter. While playing around with the knobs on the pedal can give you interesting and unique sounds, there are a few things to take into consideration, especially when there’s a pitch shifter. It will not sound that realistic because the more your original pitch is altered, the more robotic it will start to sound no matter what pitch/octave you are at. Now certain people may like this, but preferences may vary. Some guitarist like having an octave or pitch shifter in their setup, but as a beginner, you could go without them. A tremolo pedal is based off an LFO that modulates the volume of the signal. You often find tremolo effects on electric pianos or organs, where when a note is being played, tremolo causes the sound to modulate the volume up & down quickly – in simple words, becomes louder and softer. Most modern tremolo pedals stereo, so instead of the volume being modulated in the middle(mono), it bounces from left to right or vice-versa. Most modern tremolo pedals are stereo, so instead of the volume being modulated only in the middle (mono), it bounces from left to right or vice-versa. This can sound really nice if you are performing in a nice setup with a proper sound system set-up or if you’re recording. Controls on a tremolo pedal vary on the types of pedal you plan to buy. Typically most tremolo pedals have controls for the rate (the speed of the tremolo) and tremolo depth (the less or more amount of the effect). By now, you are probably wondering which guitar pedal to go for as a beginner. The truth is choosing suitable guitar pedals all comes down to your personal preference. My advice is to experiment as much as possible and worry less about getting the ‘right’ gear. There is no wrong or right when it comes to art anyway. However, as a beginner, striving to learn and master the craft, good dependable gear can also make you more productive in achieving mastery. 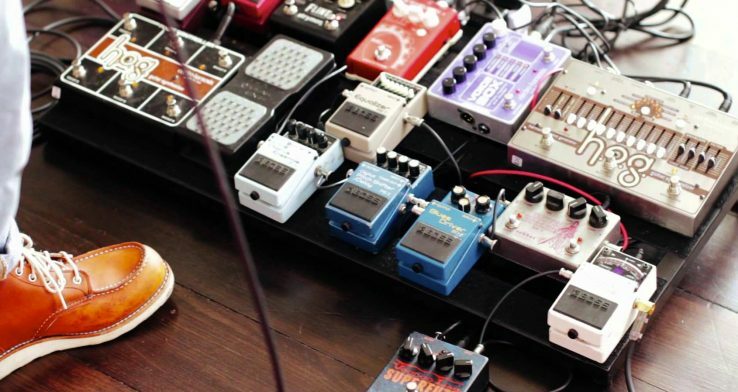 So you got your electric guitar and your amp ready, but you can’t stop but to wonder about the types of pedals your favorite artists are using. You simply can’t make up your mind! Worry not, as I’ll be helping you narrow down to the necessities of shaping your ‘personal’ tone. First, I suggest getting an EQ pedal like the Behringer EQ700 Graphic Equalizer Pedal if you are on a budget, but if you have the extra budget, the Boss GE-7 7-band EQ Pedal will be an excellent choice as it gives you lots of flexibility in shaping your tone. If an overdrive or gain pedal is what you need, the Behringer Vintage Tube TO800 is a great option for beginners. At a slightly higher budget, the Ibanez TS9 Tube Screamer is a great sounding option. Any of these two would last you some time. Maybe further on you can maybe invest in a decent reverb pedal as that would help you get that spaced out feeling but if your amplifier already has a reverb option built in, I suggest sticking with that first. Preferences may vary but these are just my picks. Or if you are on a tight budget and don’t really have the money to buy individual pedals, you can always check out multi-effect pedals. These pedals are the bang for your buck as it has most of the effects you need, packed into a digital device. Now you may ask me, why not just get a multi-effects pedal and just move on that way and why should I buy individual pedals when I can get a pedal with everything. You may wonder at this point, why not just get a multi-effects pedal that does everything and do without the expensive individual pedals? The reason is that while multi-effect pedals may have everything you need, most of them are based off simulations of other pedals and may not sound as genuine. If you have an ear for tone, you’ll find multi-effect pedals to not sound as realistic as it seems.there are some pretty decent multi-effect pedals out in the market right now and if you just want to have the whole package but for a good price, I suggest investing in a good multi-effect pedal and it will bring you a long way. That said, there are some pretty decent multi-effect pedals you could get your hands on. I’d recommend getting a decent one if you’re on a budget, just starting-out, or taking guitar playing as a hobby. However, if you see yourself actually taking one of these things out for performances and recording, I suggest investing in a good multi-effect pedal. It also helps to find multi-effect pedals that come with a looping function. While many other effect pedals weren’t mentioned in this post, what I’ve covered here are possibly the essential guitar pedals you should get if you’re starting out. For more information take a quick look at the infographic above and leave a comment below if you have any questions about effect pedals or how to find the best one for your needs. What are some guitar pedals that you’ve bought recently and how did you find its sound? Let me know about your experiences as they would also help out the many guitarists, producers & musicians reading this post. Great Article!! loved the Guide To Guitar Effect Pedals & Boards.